To avoid abnormal cell activity that can lead to, for example, tumour growth, the cell cycle has three checkpoints to regulate itself. 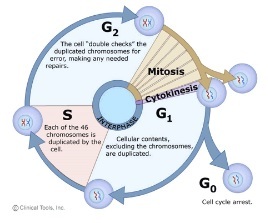 Mitosis only occupies small percentage of cell cycle. The remaining time is used for copying and checking of genetic information. Mitosis is the process of cell division which results in two daughter cells which are identical to each other and to the parent cell.